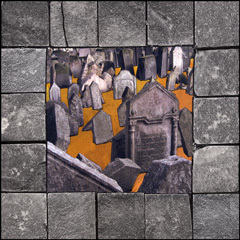 My search for a meaningful way to portray the stones of Prague evolved from my photographs of charming cobblestone streets into a more profound depiction of the stones in the Old Jewish Cemetery. I was fascinated with the multitude of gravestones crammed in one upon the other - as many as 12,000 - representing generations of Jews from the 15th through the 18th centuries whose burial was restricted to this small area of the ghetto, Josefov. I looked for a way to express the stones' deeper significance. 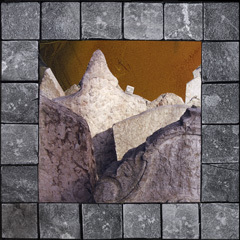 In these five collages I combine the poetry of tilted headstones with my alcohol ink infused papers, all within a surrounding gray grid of granite and slate images. 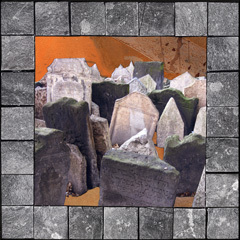 In "Josefov Markers - Quartet" I have included visual reference to the Maharal's tombstone and a hulking figure, the Golem of Prague, a giant creature that, according to legend, was created by Rabbi Löwe from clay and magically brought to life to protect the Jews of the ghetto from anti-Semitic attacks during the 16th century. During WW II Hitler ordered that this particular Jewish cemetery be left intact. He wanted it to be the centerpiece of a Jewish museum planned for Prague after all the Jews in Europe had been murdered. It was to be called the "Exotic Museum of an Extinct Race." It is ironic that this oldest existing Jewish cemetery in Europe survived even during the German occupation of Czechoslovakia and despite the Nazi policy to destroy all Jewish landmarks. My experience of Prague's Old Jewish Cemetery was both harrowing and inspiring. Even in the presence of so many markers of death I remained aware of the remarkable legacy of Jewish survival.